We sell only the original Sun Ancon Chi Machine™. The Sun Ancon Chi Machine™ is a product that blends the ancient arts with modern technology for a unique and therapeutic experience. Learn more about the Chi Machine. On Sale - Save $150! Enjoy the warm, comfortable, soothing feeling of far infrared rays heat in your own home. The arched 160 degree design greatly increases warming coverage. This unique design is the hallmark of the SOQI Ceramic Heater. Learn more about the SOQI Ceramic Heater. On Sale - Save $80! The Advanced Electro Reflex Energizer (ERE) is a full body experience that provides four modes of massage: pounding, relaxing, massage and auto-circulation. Learn more about the Advanced Electro Reflex Energizer. On Sale - Save $65! Far Infrared Rays (FIR) work in harmony with your body, safely penetrating deep skin tissue to activate cells, reduce stress, and increase energy. FIR can help blood circulation and give a feeling of comfort to the body. NEW Grande XL FIR Pad in a massive size of 23.43" x 45.47" also available! Learn more about the FIR Heating Pad. On Sale - Save $90! Negative Potential Energy = Energy for Rest. Balance and maintain your organ functions, and enhance muscle strength. Increase different physiological functions. Learn more about E-Power. On Sale - Save $210! Integrating motion energy, thermal energy, and spa music into a multi-energy product, the SOQI Bed Total Health Spa combines Eastern health philosophy and modern technology, and is capable of delivering this technology to every home all over the world. Learn more about the SOQI Bed. On Sale - Save $30! Go Green is a powdered dietary supplement that mix with water or your favorite juice. It is formulated to energize, revitalize, alkalinize, cleanse, facilitate mental energy, support a healthy immune system and much more. Learn more about Go Green. This heated lumbar support cushion is an orthopedic spinal support pillow with built in massage and far infrared heat that is ergonomically designed to relieve back pain. Learn more about FIR Lumbar Support Cushion. On Sale - Save $100! The Chi Machine comes with a 14 day free trial. If not 100% satisfied, return it for a full refund. The Chi Machine comes with a two-year warranty. Protect your Chi Machine while traveling with a custom travel bag from HTE. 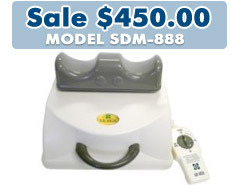 Interested in selling The Chi Machine and other quality HTE holistic healing products through your practice or business? Read complete details on becoming a distributor. We are an HTE USA authorized distributor of Sun Harmony/Sun Ancon Chi Machines, HotHouse, Electro Reflex Energizer (ERE), SOQI Bed and other Hsin Ten International holistic healing products. Please feel free to contact us with any questions you might have about the products we carry or anything else. We'll do our best to help! The Chi Machine Shop is an HTE Americas authorized distributor.